AT&T may have improved their dropped call performance lately, but they've still got a lot of work to do. According to a recent survey from ChangeWave Research, AT&T customers experience 3x the percentage of dropped calls as Verizon users. Ouch. There's no question that AT&T has put serious resources behind improving their network, and major improvements are expected for this summer. But until users start actually feeling those improvements in their day to day lives—without having to resort to a MicroCell 3G—there are going to be a lot of folks interested in jumping ship if and when the iPhone ever hits Verizon. Are You Feeling AT&T&apos;s 100 Day Plan to Fix Their Network? The opinions compiled in this survey are dramatically at odds with actual quantitative results derived from millions of calls made during extensive drive-testing of the AT&T mobile broadband network by a highly respected outside firm. In fact, the statistically valid drive test shows the AT&T network continues to deliver the nation's fastest 3G network and near best-in-class call retainability nationwide. AT&T's network dropped only 1.44 percent of calls nationwide, within two-tenths of 1 percent of the industry leader and a difference of less than two calls out of 1,000. 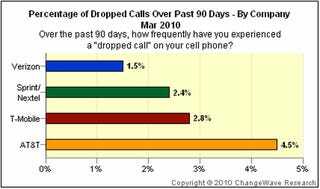 It's true that how often people think their calls are dropped is entirely different from how often they actually are. And there's also no clear indication from ChargeWire which markets were tested (another GWS survey shows that in NYC drive testing, AT&T and Verizon are neck and neck for reliability), which makes the survey less than helpful on an individual basis.